Stand this cellar on the floor in your den, TV room, or office! Individually handcrafted in a thirty-step process, the EuroCave Performance 259 will provide years of smooth, quiet, vibration-free service with the utmost ease of operation. Stored in these true wine cellars, your finest vintages will develop to their full potential. The Performance 259 series has built-in versatility: build this wine cellar into your kitchen counter, or stand it on the floor in your den, TV room, or office! Also the security lock and key will keep your valuable collection protected. Available with either a 1-Temperature Zone or a Multi-Temperature Zone. The 1-temperature cabinet re-creates the natural deep cellar and ensures a constant optimum temperature between 55°F and 57°F. The hygrometer provides an LCD display to advise of humidity range. Built-in alarm alerts when humidity level has fallen below 50%. Water can be added to cassettes to increase humidity to optimum range of 50-80%. 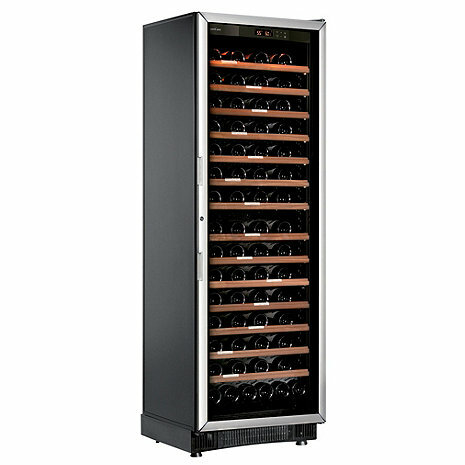 The multi-temperature cabinet has a temperature graduation; the upper section (59-72°F) for red wine service and the lower section (41-54°F) for chilling white wines and champagne for service. The unit will create a temperature graduation from the top to the bottom using the two temperatures that you set as the minimum and maximum. The unit can also be used for long term storage for proper aging of your wine. The multi-temperature unit does not contain a hygrometer or a lava rock cassette. *Capacity is based off using standard Bordeuax size bottles, using larger size bottles may limit the capacity. If you would like to store larger bottles you can easily adjust the height of any of the shelves. Additional shelves will lower bottle capacity. The first unit that was shipped to me was DOA and missing the extra shelves I had ordered, and I rejected the shipment. WineEnthusiast accepted it back and sent me a second unit within a few days, and I received the shelves separately. The second unit has a ding on the top of the door but the seal (and window seal) was intact and I didn't want to wait for yet a third unit. The unit has been working properly and keeping my white wines at serving temperature. As for the shelves, I had ordered MDS shelves but got the flat kind. It turns out that the flat ones are more useful for half-bottles since I can fit more of them on a shelf, so I'm glad I ended up with those. new shelving quite an improvement and unit runs very well - do expect that with the bottle shenanigans of longer necks and wider bottles these days you will not be able to max out storage but I am well pleased with its quality and sharp look (I bought stainless). my sales rep Dino was wonderful! The Eurocave Performance 259 is working well and looks jst great in our newly remodeled Kitchen. It is a quality product. The Eurocave was ordered by my contractor. What I cannot understand is why is has so few shelves. I suppose I now have to order additional shelves in order to take full advantage of the unit. You would think when purchasing a quality product like Eurocave the shelves would be there and if you wanted more room in any section of the unit, the owner could just remove the shelf and put it aside for later use.